Finance Minister Tommaso Padoa-Schioppa has just forecast 2% growth for the whole year 2006. After a slowdown to 0.3% in the third quarter (which may, of course, be about to be revised upwards) it seems he is expecting some real heavy lifting in the fourth quarter. We will see. ``The economy is recovering,'' Padoa-Schioppa told reporters after a meeting of euro-region finance ministers in Brussels. ``The problem is for that to turn into growth. That is something that lasts for years and not something that lasts just one economic trend.'' Padoa-Schioppa forecast growth to near 2 percent in 2006. Italy's latest growth forecast had indicated the $1.8 trillion economy would expand 1.6 percent this year and 1.3 percent in 2007. Italy has lagged behind the average growth of its euro region partners for more than a decade and will continue to do so through 2008, according to the European Commission. 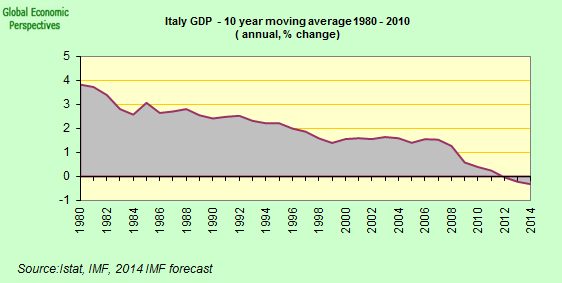 If Italy grows at 1.6% annually for 30 years, then the economy will be 62% larger at the end of the 30-year period. If the USA (for example) grows at 3% annually, then its economy will be 145% larger. In Italian they say: if my grandmother had wheels she would have been a wheel barrow. A lot rides on "IF" doesn't it? and Italy's performance has been stronger. These numbers seem to confirm a trend in which Italian results are better than French results and EuroZone results are better than results in the United States. This is a very strong statement Dave. There was a time when trend growth of 2% (even in the US) was considered pretty damn good. You need also to think about population changes. Italy's population (ex immigration) is now declining, and has been doing so since the early 1990s. US population is still growing at quite a clip, so logically needs to grow faster just to maintain living standards as they were. Not that you haven't got a point. Italy needs to grow faster than it has been doing, but not just for any old reason (this *isn't* a weighlifting contest, and there is nothing magically attractive about growth for growths sake, as we can see when we look at the way global temperatures are rising). Italy needs to grow faster than it has been since it needs to maintain a growing elderly dependent population, this is the problem. Of course an ageing Italy finds it harder to grow. But even if Michael Jordan now cannot run as fast as he used to be able to do when he was younger, I doubt there is much to be achieved by telling him he is pathetic, and indeed he might be rather offended. You could even say the comment was 'ageist`. "and Italy's performance has been stronger. " OK, thanks. I was looking for the Italian services data. I will post on this. "These numbers seem to confirm a trend in which Italian results are better than French results"
I've absolutely no axe to grind here, but I would wait a bit before jumping to this conclusion. France had a very bad third quarter. Personally the reason for this is a complete mystery to me. Part of the story may be the comparatively higher euro and the negative trade balance, although why this should affect France so much more than Italy is still a mystery. Otoh I would expect France to rebound, since I think (aha) that it is probably the most robust economy in the eurozone. So let's wait and see. The Geramn performance is muddling everything up at the moment, and I think we may need to wait till we see January's data to get a really clear picture of where this is going. "EuroZone results are better than results in the United States." Yep, well do just remember that by the same token which suggests that what goes up does come down, what goes down also comes up, and the jury is still out on what exactly is happening in the US economy afaic, Nouriel Roubini notwithstanding. I think everyone is confused at the moment Edward but there are some fairly monumental shifts (notably in capital flows and credit growth) going on at the moment. My impression is that we are at a bit of a bookend of an era: the end of easy (cheap) international capital for deficit economies. But we will all have to wait and see. I don't know exactly what ails France but there is a lack of confidence in the Government and quite a lot of consternation about the "quality" of the Presidential candidates on offer next year. France hasn't really reformed and doesn't seem to know how, Italy I think is at the brink of a "new era". Too many reasons to go into here, but over time I'm sure we'll get to them. Ciao. Incidentally Paris you will note that I am not going to engage in these EU vs US type debates, since I regard them as pretty sterile. As an economist I am happy when things go well for people, wherever they are, and conversly it never makes me happy when things go badly. (Of course the technician inside me cannot help being fascinated by economic problems, but only for what can be learnt from them, not for any intrinsic pleasure). Meantime you might like to note that US services are also expanding, and while the indexes are not comparable I don't imagine, they are probably expanding rather faster than they are in Italy, at a rate which is closer - surprise surprise - to the French rate. (For a good appreciation of just how much France and the US are wedded together as twins can I recommend Bertolucci's "The Dreamers"). "The Tempe, Ariz.-based Institute for Supply Management reported Tuesday that its index of activity in the service sector rose to 58.9 in November from 57.1 in October. Analysts were looking for a reading of 55.5." Of course what lies behind all of this - and it is of course a point that most commentators are missing - is the demise of manufacturing. So if over time services continue to expand while industry stagnates the importance of industry as an economic entity will shrink towards the current agricultural levels. 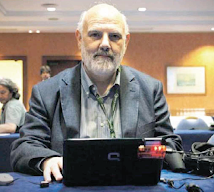 "I don't know exactly what ails France but there is a lack of confidence in the Government and quite a lot of consternation about the "quality" of the Presidential candidates on offer next year." OK. So you don't buy the Segolene argument. Here in Spain they are calling her "La Zapatera"
I agree France badly needs reform, but my guess is we will get it after the presidentials, whoever wins. "the end of easy (cheap) international capital for deficit economies." As you may have noticed Claus and I don't actually buy into this part, we think Japan is headed back to Zirp, but as you suggest we will have plenty of time for this. THE Media might be excited but on the street the choice seems to be between a fascist and an airhead. And people are dismayed. In fact some are even trying to convince Chirac to run again because this leadership (and Villepin is included in the sorry bunch) is seen as a bit of a joke. Très sad unfortunately. Don't know where zirp is but I think Japan may be in trouble. Could be a bit interesting on financial markets. Though just heard Jim O'Neill (Goldman Sachs) interview. He seems to be quite chirpy about everything. Including, I might add, the Italian Deficit and the Aging Population saga!! Cheers.